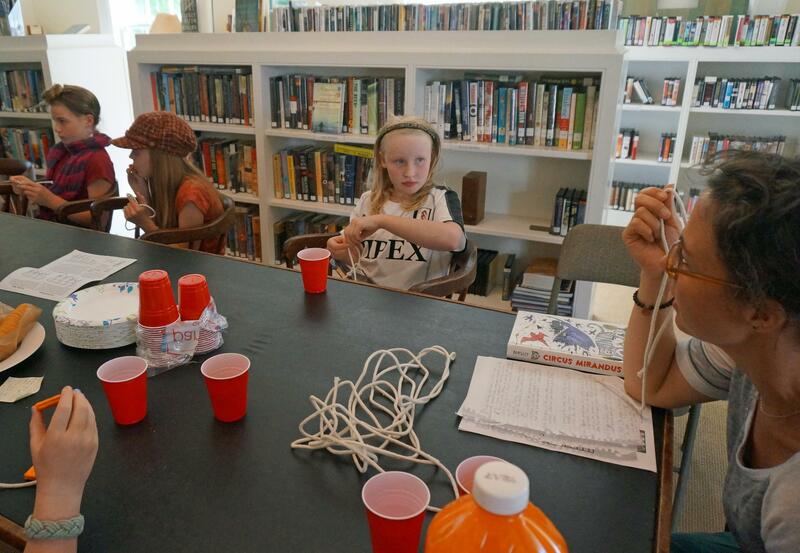 These Dorothy's List readers at Peabody Library, in Post Mills, got a chance to show off their knot tying skills while discussing 'Circus Mirandus' by Cassie Beasley. Knots are a recurring theme in this story about a traveling circus that only appears to kids who believe in its magic. Children's librarian Emily Zollo reminds the kids of the cardinal rule to get a ticket to Circus Mirandus: You have to believe it to see it. "Usually the common phrase is you have to see it to believe it," she points out, "but Cassie Beasley changed that around – you have to believe it to see it." That twist of phrase connects to another theme of Circus Mirandus – it's all about twisting perceptions of reality. The main character, Micah Tuttle, grew up listening to his Grandpa Ephraim's wild stories about Circus Mirandus. But it isn't until his grandpa is dying that Micah learns the place actually exists. As Grandpa Ephraim tells Micah, you can't just buy a ticket to get into Circus Mirandus. The ticket has to come to you. When young Ephraim first went to the circus, his ticket actually swam into his boot. It was a magical fish! Children's librarian Emily Zollo asks readers their thoughts on the theme of knots that is woven through the story. 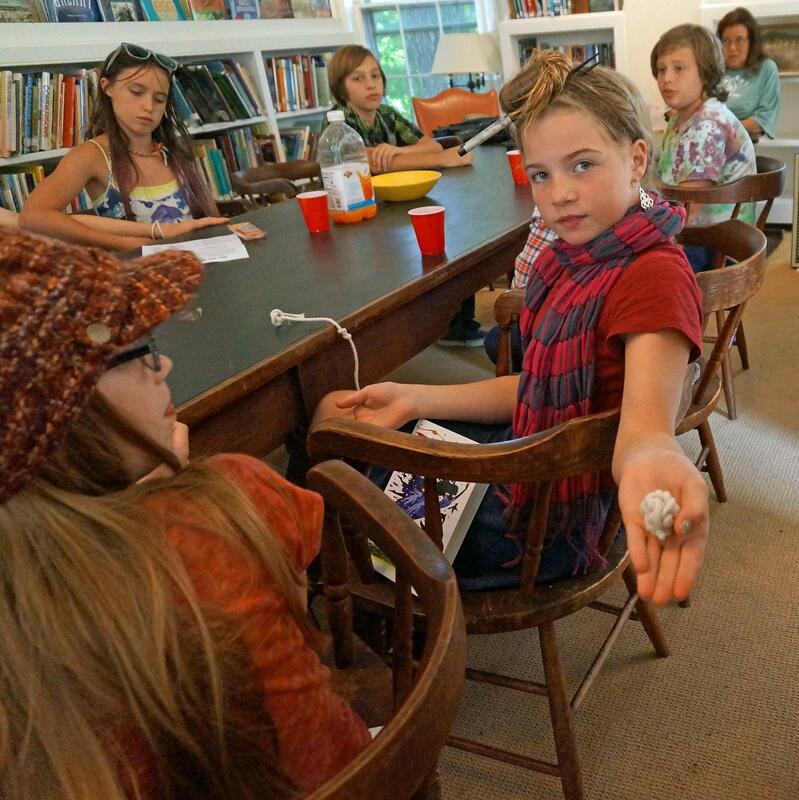 The middle grade readers gathered in the Peabody Library are full of questions for the story's author, Cassie Beasley – a graduate of the Vermont College of Fine Arts. Maggie Langlais: Why did you choose to use such strange objects for the tickets at the circus? Cassie Beasley: You know, I didn't know I was going to use all the funny objects for the circus tickets until I got Ephraim up to the door of the circus, and of course there at the gate is Geoffrey the ticket taker ... He was standing there and he was demanding a ticket. And I thought, 'Oh my goodness, what is my character going to hand him? He doesn't have any pocket money. He can't buy a ticket.' And I thought, 'Oh, well earlier in the story I had that fish swim into his boot. That's going to be his ticket.' And from there it was really fun to make up all of the different ticket ideas. And to kind of have this place where your ticket is something you've picked up over the course of the day or the week, and it's kind of what led you to this magical place. Grandpa Ephraim has filled Micah's imagination with stories of the flying Victoria and an illusionist he calls the Lightbender. But Micah only visits Circus Mirandus for himself after his grandpa gets sick. Even while Micah is taking in the wonders of the circus, he's worried about losing his sick grandpa. Erin Langlais: Was there someone in your family that had a sickness and you decided to write about it? Cassie Beasley: I did not get Grandpa Ephraim's story from any specific event in real life. It's more the kind of thing that happens to you as you grow up. You encounter friends and you have family members who do go through hard times, and you learn how tough that is. And this is Micah's, one of his first experiences with that. And that's something I wanted to write about. Because I think that's something a lot of us go through as we grow up. And so, it was good to delve into the fact that Micah's dealing with this really, really hard situation with Grandpa Ephraim being so sick and him being so scared ... At the end of the book you feel like he's really learned something about himself and about the world and about how much he's capable of. Circus Mirandus is populated with fantastical characters, from Micah's mean Aunt Gertrudis – who doesn't like kids – to Victoria, an equally beautiful and evil circus performer who can fly with her bird menagerie. Gabby Anzalone used every inch of her rope in tying this complicated knot. Maddie Thaxton: Did you change the characters? Did you make the characters different before you settled on the actual characters that are in the book right now? Cassie Beasley: That is a great question, Maddie, and, you know, I actually did change some of the characters. My main character, Micah, stayed the same and Grandpa Ephraim has always been the same. So, those two are kind of the heart of the story. And they've been there since the very first draft. But I did work on Aunt Gertrudis' character to change her up a little bit and make her a little different. And I also worked a lot on Victoria. Beasley adds the villainous Victoria wasn't even in the first drafts of the story. Cassie Beasley: She came into later drafts and I worked on her character along and along until I turned her into the very scary lady that we all know and love now. That was a lot of fun, and it's really fun to see a story grow and change as you go through different revisions of it. This story went through about 12 really major revisions before it was actually ready to see the world. Piper Leibon: Where did Victoria go when she left the circus? Cassie Beasley: Oh, this is such a dangerous question. So this is the kind of thing that I might want to address one day in a sequel. But I will tell you a little bit. As you know, Victoria kind of has in mind the idea of – she hints at it in the book – of going and finding other magicians who are like-minded. So she's not really into the whole Circus Mirandus thing which is this idea of this wonderful, magical place that inspires children and that tries to increase the happiness and joy in the world. She kind of wants something a lot more selfish for herself. And so she's going out into the world to find people who feel the same way as her. And she does find them, I'll tell you that much. Sadie Mikovitz: What inspired you to write about a circus and the characters that are in the story? Beasley says she drew inspiration for Circus Mirandus from many different places. And one character was influenced by someone close to her heart. Cassie Beasley: One of the characters is a very funny parrot named Chintzy, and she is actually the only character who is based on my real life. She is based on my pet parrot, who is an African grey parrot. And she says really, really funny stuff all the time and she likes to bite people, just like Chintzy does. And so they would get along well in real life, I think. 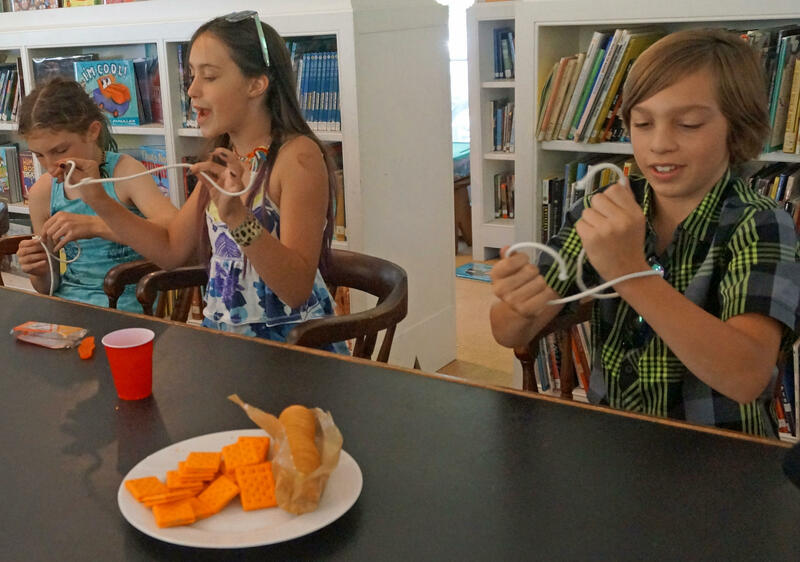 Madelyn Durkee, Sadie Mikovitz and Michael Fernandez make up their own knot creations. Michael Fernandez: Did you write when you were a kid? Cassie Beasley: I did write when I was a kid. I started writing pretty seriously when I was in about sixth or seventh grade. That was when I decided that writing might be something that I wanted to do for a living – storytelling. Before that it was all just daydreams. But at that point I decided it might be something I wanted to share with other people. And Beasley has some advice for kids who want to try writing their own stories. Cassie Beasley: I always encourage kids who are interested in being writers to go ahead and get a journal and sit down with it every day and write out your thoughts or make up your own stories. And it can be a lot of fun. And it's something you can actually share with friends. You can share with your family. And that gets you into the habit of writing every day and of sharing your work and not being afraid to kind of put yourself out there. Alex Fein: What made you come up with the name Mirandus for Circus Mirandus? You could say 'mirandus' refers to something you have to see to believe – or maybe it's the other way around.